TODAY'S GREEN MANTRA: "I will green up and toxify down my laundry habits and products conserving water and reducing pollutive practices which cause me, my children, my planet, and its inhabitants health harms. Due to water shortage, environmental impact and plain ole common sense, we can't really afford to act like the 20-year-old version of myself. 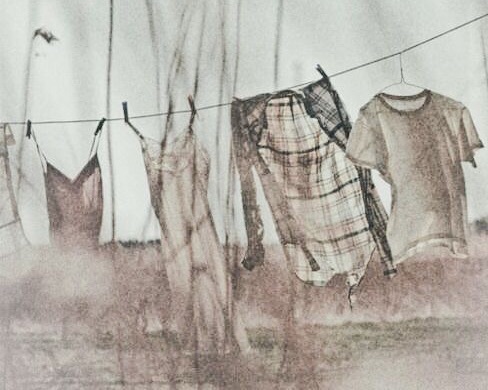 Washing our clothing is a luxury and most of us have advanced our relationship with deodorant and soaps enough that we can make shirts and sweaters last until we stink them up proper. I understand that for those with children it is a completely different story and though I recommend you follow as many of these suggestions as you can, you're likely working a full load per day, and I won't judge you for it. I wrote last week about eco washing machines, which is a recommended solution to reducing water and energy waste. 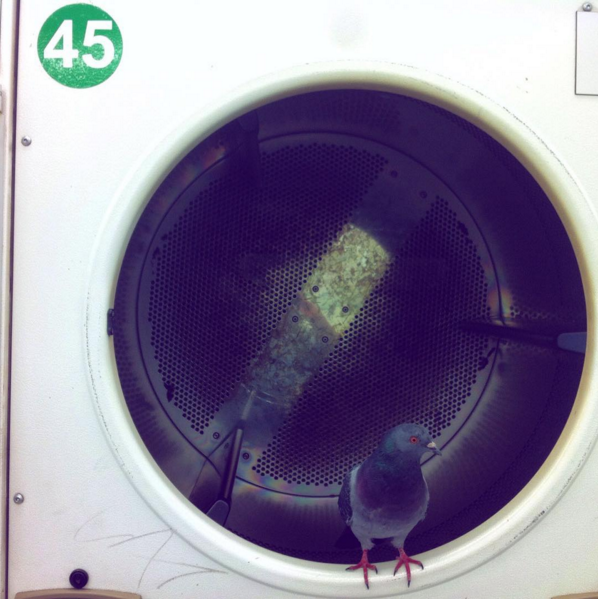 But here in Europe, where the laundry mat is where it's at, and where you can barely convince the owner to clean up the droppings from a wayward pigeon in the dryer drum, requesting they refit their entire business with brand new gear is a long shot. I'm not talking about your socks and underwear, though my husfriend likes to step repeat that gear, I'm still a one-time-use gal for those two particular pieces of personal wear. I wash my knickers, bras, bathing suits, running gear, t-shirts, and socks by hand (haven't lost a sock pair since). This lets me prolong the washing machine wash longer. The sun and the wind, when the weather is fair and a clothes horse indoors when the rain and cold come. Our last place had one built in so that it folded over the shower! There are some crazy good DIY ideas on Pinterest to make it easier to dry your ditties at home. This is where I wash my undies and such, just bring 'em on in and clean 'em on up. We use Dr. Bronner's 18-In-One Soap in our shower so we can wash our bodies and our gear. Works like a damn charm and we save mucho monies on soap and on water / washing machine. If you handwash in the sink with a biodegradable soap, you can use the greywater for plants. Conventional soaps are FULL OF HARMFUL CHEMICALS which hurt your health (causing birth defects, cancers, reproductive issues ect..) and the health of the environment. It is especially TOXIC to wash your children's/babies clothing in these soaps. HERE is a list of ingredients you want to avoid at all costs. Using a concentrated, biodegradable soap you're spending less and will get more out of it (buy it in bulk and you'll save even more). We use a dollar sized squirt to do a whole big load and it always comes out sparkling. As I mentioned yesterday, it's one of the worst guys when it comes to chemicals. Try a non-chlorine laundry whitener. This should be obvious, plus it will save you time and money because you'll use far less water. If you're lucky enough to not be using public laundry mats, pretend you are, as (hypothetically speaking) no one in their right mind would drop €20 of their croissant binging money on a wash/dry if the thing wasn't crammed full of filthy gear. Because it's cooler (pun so very intended) ... your clothing will last longer and your energy consumption will be lower - PLUS - nothing you own will ever come out Barbie sized again. If you've got stains, pre-wash the stains (ideally still after they happen) in the sink with eco soap and a scrub brush. I don't use dryer sheets, but I know lots of people who do. I'm pretty sure, like diamond rings, it's just a marketing ploy. Fabric softeners are the #1 indoor air polluter, whenever you smell that 'Laundry Smell' you're inhaling VOC's (click here to see what they do to you and your kiddies). But if you're a believer in them, there are eco dryer sheets available and fabric softeners too. But for these two, it is best to just abstain from using them. Something to save up for, but there are tons of eco washing machines to choose from which will save water and electricity, the planet, and your pennies. Click HERE for a guide to eco washing machine buying.